On the eve of the midterm election, Democrats and Republicans scrambled Monday to make their last-minute appeals in a campaign marked by rhetoric about undocumented immigrants and a bitter debate over the presidency of Donald Trump. In rallies, Trump has talked in apocalyptic terms about the threat of a caravan of migrants slowly making its way toward the U.S. border and chaotic consequences that will occur if Democrats gain control of Congress. On Monday, Trump hit the Midwest with final rallies in Cleveland; Fort Wayne, Ind. ; and Cape Girardeau, Mo. – a furious finish to his marathon of 11 rallies in eight states across six days. Meanwhile, former president Barack Obama and other Democrats are making their own closing arguments, accusing Trump of fearmongering and criticizing Republicans over health care and who deserves credit for the country’s recent economic gains. At stake Tuesday is control of the House and the Senate, 36 governorships and hundreds of down-ballot races nationwide. Dueling rallies this past weekend pitted the president against his immediate predecessor as the two lashed out at each other in highly personal terms. On Monday, voting rights and ballot security took center stage. The focus on immigration and the power shift at stake Tuesday have triggered unprecedented turnout in some areas for a midterm election. In El Paso, for instance, the 12-day early voting period that ended Friday saw 139,000 El Paso residents cast ballots – more than three times the 2014 early voting turnout. The town has historically had among the lowest turnout rates among major U.S. cities, but it is now on track to at least double its total 2014 turnout of 82,000 votes. Over the weekend, Trump devoted much of his rallies to personal attacks on his predecessor, saying that Obama “did not tell the truth” when he told Americans that “you can keep your doctor, you can keep your plan” under his signature health-care legislation. “He said it 28 times, and it wasn’t true,” Trump told the crowd Sunday in Macon, Ga.
Obama delivered a blistering critique of Trump, accusing the president and Republicans of “just making stuff up” and mocking them for claiming ownership of economic gains that began on his watch. 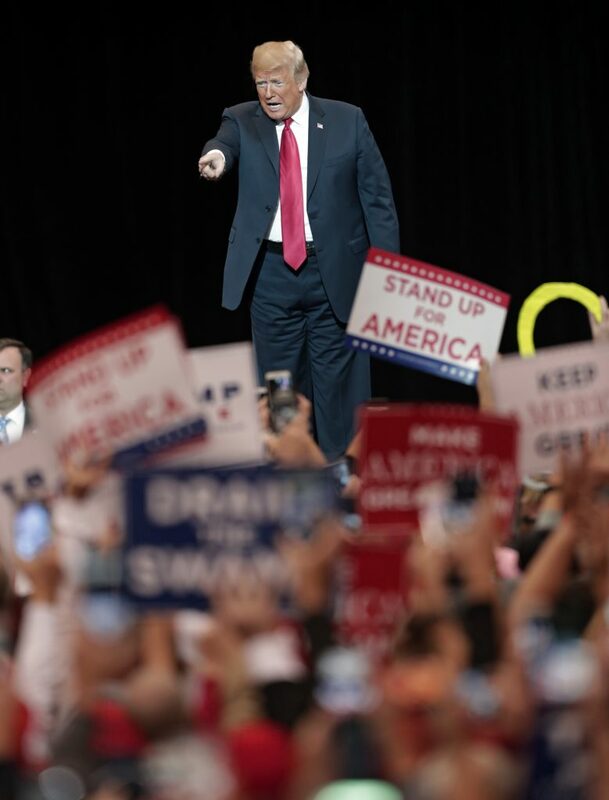 At a rally Sunday, Trump took a particularly harsh line on the immigration issue as he vowed to cut foreign aid to Central American nations he said had done nothing to stop a group of migrants traveling toward the United States. 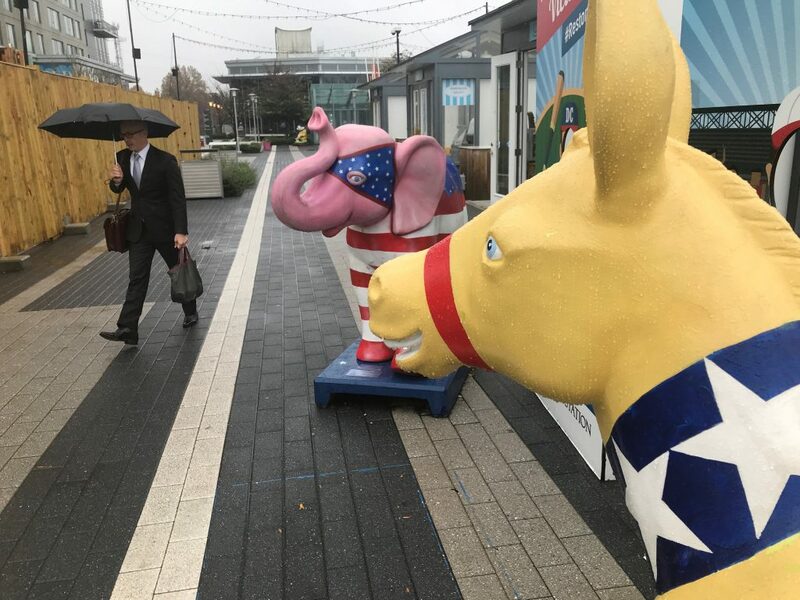 A commuter walks past a symbolic Republican elephant and Democratic donkey at the Wiehle-Reston East Metro station in Reston, Virginia, Monday, one day before U.S. congressional midterm elections. President Donald Trump acknowledges supporters before speaking at a campaign rally, Monday, in Cleveland.